Finished fifth in a CheckRayz player appreciation tournament at Poker4Ever. First time I have played there since they announced that they would not allow USA players, then reversed themselves. Made the final table of an OPT $10 buy at Poker.com, but finished out of the money. Ring table action at Poker.com continues to be good. Even with some bad beats and tough hands that I lost, I am still doing well. Poker.com continues to be the best online poker site, in my opinion. Before I get to posting a year-end review, I got one of those little reminders about what poker can sometimes be about. I heard someone on a radio show stating that some of the superstar poker players today are just the latest incarnation of crooks and thieves from the past. I mean ... how many of them have more than their share of grifter tales? Have you read all the crapola about Brandi Hawbaker and Captain Tom Franklin? Talk about a poker soap opera. Real life can oftentimes be better than anything television can make up. When many of the poker sites decided to say no to USA players, we found out who some of the good guys were, and unfortunately, who some of the bad guys were. Some sites gave us plenty of warning and acted in a respectful way. I may have slammed Titan Poker many times for the unbelievable river beats I received, but Titan was among the best at being up front and giving plenty of time to cash out. I can't say the same for some other sites that gave perhaps a one hour notice before closing accounts ... and keeping money. Yeah - we sometimes get reminded that poker and slime go together quite frequently. PokerRoom.com, however, takes it to another level. In one of the worst public relations moves in recent memory, PokerRoom.com awarded money for a $19,000 Guaranteed tournament, and then after saying that there was error, TOOK MONEY OUT OF THE WINNING PLAYERS' ACCOUNTS! Makes you wonder how "safe" our money ever really is. I have already told myself that at any time I could get screwed over by any poker room, forum, or organization. There is a risk to virtually everything in life, and online poker seems riskier than most. I only hope that I never experience what some of our unfortunate poker brothers and sisters received as a Christmas gift from PokerRoom.com. I got into Las Vegas on December 17 for a three-night poker trip. I was surprised that there were as many people as there were, considering that I was going during what was supposed to be one of the deadest weeks of the year. I checked into Harrah's late afternoon and headed to one of my favorite poker rooms, Bally's. The Bally's $1/2 NL game had been especially profitable for me in 2006, and I came expecting the same. About three hands into my visit, I got pocket 9's and hit my set on the flop. They held up, and I was on my way ... or so I thought. The next 27 hours the poker gods forgot that I existed. Shortly after hitting the set, I called a small raise with A-10. The flop came A-3-4. A player to my right raised and I called. Being new to the table, I had no idea what kind of player was in the hand with me. I was concerned that he went in with A-3 or A-4. The turn was an Ace. The player to my right again bet, and I again called. What did he have? The flop was a Jack, and he increased his raise. I was guessing that he had A-J and just made his boat, but I called anyway. I was thinking that I was probably beat, and I was right. However, I was shocked to see that the guy had pocket Jacks and continued betting with two Aces on the board. He hit his lucky two outer, and now I was back at ground zero. The next hand I had top pair, okay kicker and raised. I was called by one person, who unfortunately hit his gutshot. Then ... the cards stopped coming. I was surprised to see so many local players at Bally's that night. The play was obviously going to get tougher and I was getting no cards, so I decided to watch the Survivor finale on tv and return afterwards. When I returned, the tables at Bally's were full, but I was able to get into a $1/2 NL table at Paris. This was my first time at Paris, and I did have a good time and played against some decent players. There was only one NL table, though, so options were limited. I played for several hours and came out even, getting virtually no playable hands. I decided to call it a night. On Monday I returned to Bally's and again saw very few playable hands: 9-2os, 8-3os, Q-4os -- you get the picture. It was frustrating sitting on the sideline so much. I finally gave up at dinnertime, decided to catch a quick snack, then try the Sahara 7:00 pm tournament. I was looking forward to the change of pace. 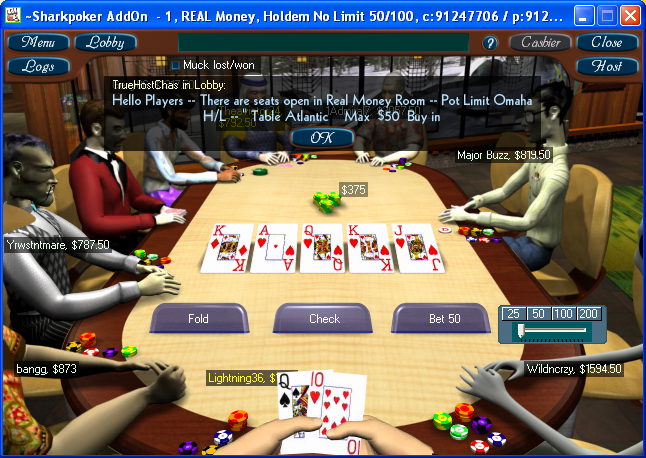 The run of bad cards continued, however, through the first hour of the tournament. After the first break, I immediately had a hand with promise - a nut flush draw after the flop. The turn did not help, but the river brought a diamond, completing the nut flush. Unfortunately, in my excitement at finally playing a hand, I failed to recognize that the river also paired the board. Yep, you guessed it - it completed the full house for someone. He raised, I re-raised, and he went all in, which I naturally called. I was shocked to see that instead of doubling up, I was on the rail. What a day! I called my wife and my brother to try to change my mojo, and then decided to hit the Wynn. When I got into the Wynn, I was put on the waiting list -- number nine for $1/3 NL. A few more people signed up, and Wynn opened a new table for us. I was surprised that the wait was so short. I bought in for $300, as did a few others. A few people bought in for less, and I was wondering how they would measure up. I got my answer on the first or second hand. Two people (each less than $300) went all in and were called by a third player. The winning hand: two pair! I had a feeling this might be the table for me. Seeing as how I was down and had been fighting bad luck with cards, I decided to start playing very tight. Now -- when the guy playing tight makes a big bet, do you think you should call with a mediocre hand? These guys didn't figure it out, and soon I was rolling in chips. I then opened up my play and just kept building my castle of chips. Within a few hours I was way in front and decided to call it a night. On Tuesday morning, I was awakened at 8:30 am by a loud alarm with flashing lights. The intercom system announced that Harrah's personnel were trying to locate the source of the trouble, but when I saw security guards searching all over my floor, I thought that it was time to get out. I threw on my smoky old clothes and stumbled out of Harrah's and into Aladdin. I was pretty tired and decided not to play in the morning tournament, so I hit the Aladdin buffet for breakfast. It was excellent, as always. I felt fatigued and decided to go back to Harrah's and sleep. After waking, I was anxious to head back to Wynn, but I wanted to give the Venetian a try. The Venetian was all that I had heard -- a very nice poker room, although not very crowded. I played some $1/2 NL and saw a lot of risk taking. People were hitting all kinds of hands on the river, including my all in getting called (I had a straight) and losing to a made flush on the river. I left down only a few chips, but had an excellent time. My only complaint was that the swivel chairs would turn and hit you when someone got up to leave the table. I wanted to spend the last night at the Wynn, so I left at 10:00 pm and looked forward to a repeat of the night before. He made big bets and raises, and was at first very irritating. As the night went on and he drank more and more, he became funnier and funnier, and really made for one of the most fun poker nights I have ever had. I usually prefer to play serious poker, but this one night I was willing to trade in my usually serious game to have fun. It was a riot. He had a few dealers who really disliked him, which made things even funnier. I played through the night since I was having so much fun, but a few crucial hands where my opponents got the cards they needed and I didn't kept me from having another big night. All those hours of poker to only come out even, but I had one night I'll never forget. I was able to sneak in a few hands of $1/2 NL at Flamingo before I left, and did enjoy the fun banter at the table. I wished that I had had a few more hours before my plane left. Bally's: Friendly dealers, fishy tourists, but an increasing number of good locals, meaning that making a profit is not as easy as before. Venetian: Fishy and daring players with a few good ones thrown in. Good dealers but not personable, nice chairs, and a generally nice and well-run place. Wynn: Fishy players who don't hesitate to reload along with a couple of solid players. Dealers need personality transplants. Nice place to play, well run. Flamingo: Fishy players with a few good ones thrown in. Dealers were funny. I will try this one again when I have more time on my next trip. I will be heading out to Las Vegas for more poker at the end of January or the beginning of February. If you have never played poker in Las Vegas, do yourself a favor and book your trip today. You will not be disappointed. Saturday is the last chance to make it to the finals of the Blogger Poker Tour at Poker.com. My goal last time was to make the final table, then shoot for top five, then take it down. I hit the rail at 13th place when I made a great call, but just lost to a three-outer. To have any possibility of making the top twenty and getting a chance to play in the Grand Final with a chance to play in the Australia Millions, I will have to play my best poker and hope for a little luck. I probably need to finish near the top, which will be quite a task. The format was changed from an Omaha game to NL Hold Em with deep stacks, so at least I won't be relying solely on luck. Time to buckle down and see if all this time I have invested can pay off. Ready to go to Las Vegas for three nights. Going solo this time. I usually go with my brother, the king of comped rooms. I'll have to pay for my room this trip, but the rates are dirt cheap this time of year. After considring several places, it looks like I'll stay at Harrah's, which will position me well for some of my favorite middle-of-the-strip poker rooms. Due to some problems at the last Online Forum Challenge freeroll at OK USA Poker, the top 100 were put in a special freeroll to determine forum honors. I was playing for the K9 Poker Tour this time, as I rotate which forum I play for -- K9, the Online Poker Tour, and CardsChat. A mix of good cards late in the tourney, good decisions overall, and a few gifts from the poker gods translated into a victory. The final table was particularly fun since two of the others in the final six were murrythecat and jermn, two excellent players from the OPT and K9. They both happened to be playing for the OPT, so I imagine that OPT will win the event. I took third in last night's home game. I have cashed in about five of the last six. I got no cards early on and then got crippled when my A-J was slaughtered by A-7, which hit two pair on the flop. However, I jusy took my time, pushed when appropriate, and either won the hands or got people to fold. So, once again I have to settle for third place, but at least I made it into the money again, which is top three at the home game. $100,000 Guaranteed saw me go totally card dead for the first hour+. Then, in the Big Blind, I got K-Qos. Everyone folded except the biggish stack Small Blind, who raised. I called and got a flop of rag-Q-rag. The Small Blind went all in, and I thought that he was just trying to muscle me out of the chips, so I called. Unfortunately, he had A-Q. End of story. Looking back, I should have folded and lived for another hand. Making a poor judgment on my opponent's hand cost me big time. It was a reckless play by a guy who usually plays a little smarter than that. Live and learn. I played well when I was near the bubble and went to the final table in sixth place. Twice near the end of the tournament, I had four cards toward a flush after the flop. However, no flushes for me on the turn or river. I was the short stack of the final three and caught pocket 5s. I went all in and was called by the chip leader, who hit trip 10s on the flop. No regrets as I was taken out on a decisive play. Can I can keep up the good play this week? I hope to make a good showing at The Mookie on Wednesday night (although it is at Full Tilt - which has not been kind to me recently), then play well at my monthly home game. I have been cashing in the home game on a regular basis, but now it is time to take the top spot. I will be making my final 2006 visit to Las Vegas this month, so I hope that the momentum continues for the next few weeks. It would be a great way to end the year. One hell of a heater all week, and then a major heartbreak. Although I did not fare too well in some of the blogger tournaments on Full Tilt and PokerStars earlier in the week, I suddenly caught absolute fire on Poker.com at the $1/2 and $.50/1 NL games and won more in one week than I ever had before ... maybe even two or three times as much. I got cards, played them to perfection, and only had one or two bad beats. I have always done well at Poker.com, and it seems to me that the bad beats and river beats even out at that site. On Friday night, I played in the first-ever K9 High Rollers tournament at Vegas Poker 24/7. Although it was a small field, I was still thrilled to take it down. Additionally, 24/7 is supposed to throw in a free entry to one of its $100,000 guaranteed weekly tournaments, so that is a $216 entry bonus. Yesssssssss. The heartbreak came today in the second to last Blogger Poker Tour tournament at Poker.com. I finished fourth in the Grand Final last season, and have frankly been embarassed by my poor play this season. My goal was the final table, but I really wanted in the top five for extra points. After getting virtually no starting hands in the first 90 minutes, I was short-handed in the Big Blind and went all in with TPLK. A call by the table chip leader doubled me up and gave me some breathing room. Later, someone raised with 8-8. I looked down to see K-K, so I went all in doubled up. I was one of the chip leaders toward the end when Flandrius raised 4,000 - which I believe was 2X the BB. I put him on A-something and knew that I would have him dominated by my A-K. I went all in and he called with A-J. I was a 67% favorite. The flop: 6-Q-Q. Two more cards and I would double up again and be a threat to win the event. The turn: JACK!!!!! I still had outs for the river (a King or a 10), but a 9 ended my game. So ... I go out in 13th place when I get burned on a three-outer. Flandrius, meanwhile, goes on to take down the event. This one really hurt. Thank goodness my kids were not around to hear my language as I cursed my bad luck.